‘Leela’ of Cow happiness, joy, bliss, prosperity……. Millions of farmers budding entrepreneurs are dependent on dairy in India. Every day Millions of people from various walks of life, including those working in corporates are passionately exploring to enter Dairy farming. Dairy farming has the potential to provide parallel source of income to agriculture, improve rural income and fulfill dreams of many entrepreneurs. However due to incomplete understanding of cow care, lack of knowledge about better practices and absence of right approach as lead to many dairy farms struggling. Currently, varied problems are being faced in the dairy. Many people have left their comforting high paid jobs to pursue their dairy dreams, but due to lack of sufficient knowledge improper approach, many of them experience struggle, financial loss, and emotional stress. KL is an effort to look back at our ancient wisdom, rethink the simple Vedic practices full of wisdom, simplicity create a more sustainable profitable model for people currently practicing dairy and for new entrants who have passion for cow care. Do you know? Many people who left their high paying comfort jobs in a hurry, to pursue their dream of cow care dairy farming, only a few have been successful. Many have failed due to inadequate knowledge, no personal or family experience in dairy, wrong approach. This has affected cow care, individuals, their family causing emotional stress and financial liabilities. It is very important to gain basic knowledge, understanding of the demands, challenges opportunities of dairy farming before you venture into. 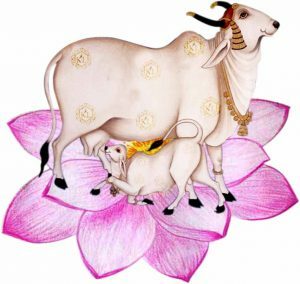 Krishna Leela is a first glimpse of cow care, the rich Vedic based formulated concepts help in providing preliminary Knowledge assisting people to think, rethink make the right decision before jumping into hastily. Did you know? Currently, many dairy farms are struggling with various challenges, experiencing immense stress and financial liability. Some of the key reasons being blind practices, complicated approaches regarding Cow housing designs, cow breed selections, Operational practices, feed practices, healthcare practices, Breeding practices, Herd management, Milking, Business Model etc. This has resulted in Cows experiencing stress, health sufferings leading to unhappy cows with low productivity. Our Vedic wisdom exhibits Krishna as an expert gau palak who had crafted mastery over cow management. His Leelas for cows were full of wisdom, Compassion, Simplicity, Natural Warmth Respect. Krishna’s cowherd practices were followed by mighty kings, dynasties architects of Indian empires. Good cow care practices are mentioned in Vedas, Kautilya’s Artha Shastra, atharvana Veda etc. But unfortunately, the age old wisdom has lost its awareness practise resulting in more challenges. ‘KRISHNA LEELA’, is an effort to create awareness about VEDIC SCIENCE for a simple, easy, low cost approach in cow welfare dairy management.